Whether a mother is a human or an animal, the love for her children or pups remain the same! 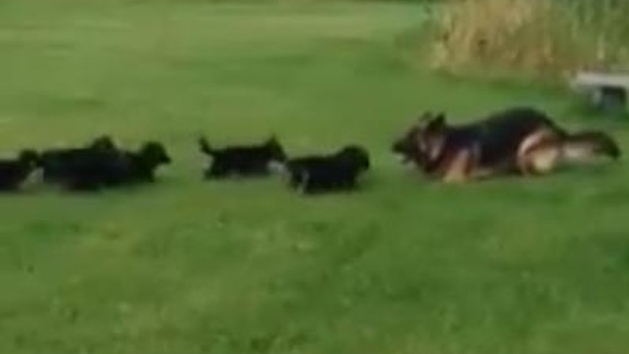 This beautiful German shepherd knows the importance of bonding with her pups and she would do anything to keep them entertained while they learn the art of being adorable puppies! The German Shepherd Dog is one of America's most popular dog breeds — for good reason. He's an intelligent and capable working dog. His devotion and courage are unmatched. And he's amazingly versatile, excelling at most anything he's trained to do: guide and assistance work for the handicapped, police and military service, herding, search and rescue, drug detection, competitive obedience and, last but not least, faithful companion. The German Shepherd may embody some of the best traits of dogs, but he's not for everyone. Originally bred to herd flocks all day, this is a high-energy dog who needs a lot of activity and exercise. Responses to "Sweet German Shepherd Mama Plays With Her Eight Puppies"